The J. Jansen Couture Line consists of unique upscale collectible pieces of art to be noticed as a standout by all. This collection is truly a signature work of art, being a little bolder in size and design yet still of the best taste. Created for upscale boutiques, casinos, galleries, catalogs and of course individuals. Each Couture piece is as unique and special as the person wearing it. The Classic Elegance Line consists of unique handcrafted metals, semi-precious and Swarovski crystals, appealing to anyone for any occasion. Created for the individual that wants to stand out in a subtler way, pieces are made slightly smaller yet still gain the attention they deserve. The individual wearing this line is sure to be noticed as having a tremendous fashion sense with a flare for the unique. Timeless Chain was crafted to offer a slightly more affordable standout piece of J. Jansen. 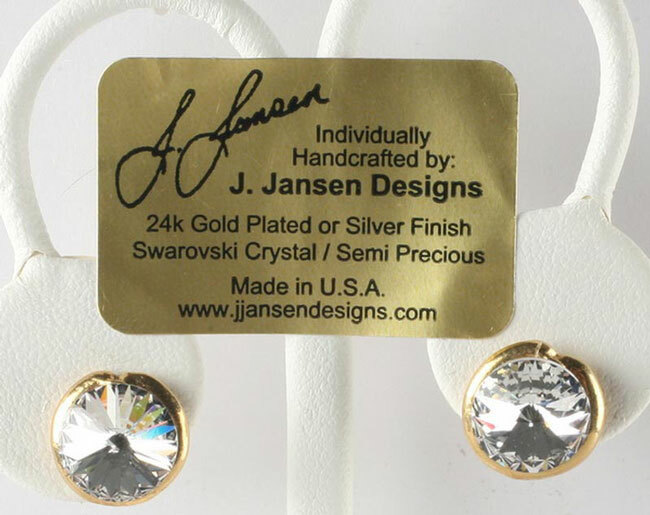 It features an easy fit and all day wear in keeping all of the unique qualities of J. Jansen Designs. It can be worn at the best event of the year, yet is subdued enough to wear to the office. This line is so diverse, anyone of any age can wear it. This collector’s piece of art will be admired wherever you go. Receive a free pair of designer earrings with your first order when you signup for a new account. We are excited to welcome you to J Jansen designs and would love to give you a free pair of earrings when you place your first order today. Simply sign up for a free account below to receive your free gift.